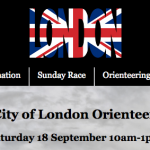 As mentioned previously, I’m hoping there’s going to be some orienteering races put on in London’s East End over the next few years – I might organise a few. 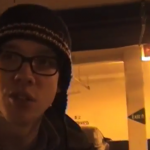 The first is likely to be a street race in April. 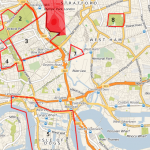 One interesting question though – where exactly is the East End? How big is it, how far east (and west, north and south) does it extend? Wikipedia has an article on it but simply says it’s east of the City of London and north of the River Thames. Here’s an old map showing from where you can hear the Bow Bells (from St Mary-Le-Bow in the City, not in Bow) ringing, presumably assuming a prevailing south-westerly wind carrying the sound north-eastwards from the City. Why is this interesting? Well, the traditional definition of a Cockney (i.e a Eastender) is someone who was born within earshot of the bells. Original source http://home.clara.net/praveen/bowmapjpg.jpg is no longer available. Modern traffic noise, even at night, means that the bells would no longer be audible at such a range. The River Lea was the ESSEX border until 1965. 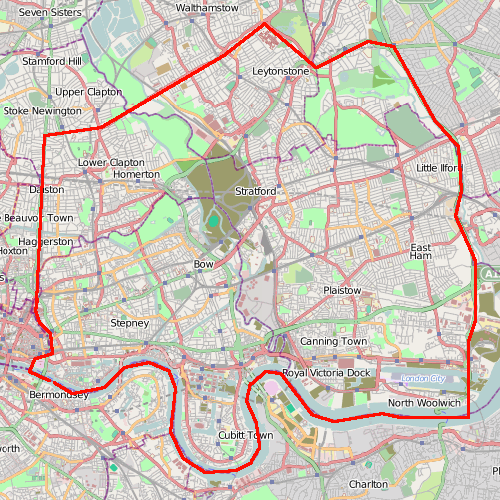 Areas East of the River Lea like Stratford, Plaistow, etc might be ‘East London’ now, but are certainly NOT East End! !